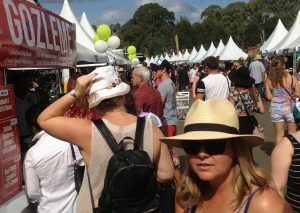 AnnanRoma food, beer and wine festival will be one of the events Camden Council will support financially in 2019. Camden Council will provide more than $43,000 in sponsorship for community programs and events to be held in the Camden area. Council has endorsed the funding to be shared between eight local groups and organisations as part of the Community Sponsorship Program. Mayor of Camden, Cr Peter Sidgreaves, said it was “fantastic’’ council was able to assist local organisations and groups in this way. “Contributing to programs and events held in our region and which benefit our community is of high importance to council,” Cr Sidgreaves said. Meals on Wheels Seniors Festival – Information Day. In other Camden news, work to upgrade the Camden Valley Way – Grahams Hill Road and Richardson Road intersection is expected to be completed in early 2019. The $3.5 million project is part of the Camden to Narellan corridor upgrade and the Australian and NSW Government’s $200 million Local Roads Package. The completion of work has been delayed due to wet weather earlier this year and changes to the relocation of water and communication services. The new configuration of the intersection was expected to be partially completed by the end of this year, with the remainder completed by early in the New Year. landscaping and replacement of trees. Three local residents – Kerrie Elias, Anne Bell and Nina Cleary – have been appointed to Camden Council’s Companion Animal Advisory committee for 2019. Mayor of Camden, Cr Peter Sidgreaves said he was excited about the additions to the committee and is looking forward to working with them in the new year. “Companion animal management is an important matter to council and the committee has implemented many successful initiatives that promote and support responsible pet ownership within our community since its inception,” Cr Sidgreaves said. The committee membership, which was officially confirmed at the last council meeting of 2018, also includes Councillors Lara Symkowiak and Theresa Fedeli. The Companion Animals Advisory Committee members for 2019 are Dr Steven Ferguson from Macarthur Veterinary Group, Dr Edward Humphries from Rossmore Veterinary Hospital, Dr Simone Maher from Animal Welfare League at Kemps Creek, Colleen Ritchard from Sydney University Veterinary Hospital, Joanne Lawrence, a dog trainer and groomer, local residents Kerrie Elias, Anne Bell and Nina Cleary. The committee was established in 2013 to provide a forum on council’s strategic direction and offer advice on the development and implementation of companion animal services, facilities and programs that may impact the member organisations and the community. More than 40 homes were entered into this year’s Camden Christmas lights competition. People’s Choice Category: Chain O Ponds Circuit.